We have returned again from another wonderful bereavement Weekend at Camp Sunshine. Perhaps the words “wonderful” and “bereavement” seem odd words to put together, but as I said in my post last year, Camps Sunshine is a very special place for families that are living their new lives without their precious children. This year there were only three families that were at their first session of a bereavement weekend. There were a few that had gone in November for the first time, so I was just meeting them, and some that were there last year who I just hadn’t had a chance to get to know. Some of the new families were there in hopes of hearing when it will get “better and easier”. Sadly, they heard the truth – it doesn’t get better or easier, just DIFFERENT! We are 2 years into our grief journey – and it is just that a journey. Grief is not something you get OVER, but you get THROUGH. There are some families that are many years into their journey. Now, there living children are reaching new milestones – heading off to college, starting grades in school that their children that have died never got to go to. It often brings up a whole new phase of grief! I know that just when I think I am doing “better” something hits me in a way, and I come crashing down again. The lows are much shorter times now, and it does take me less time to get back “up”. Spending time with people that “get it” is wonderful. I can talk about Alexander, his treatment, his death, how life is without him, without worrying that I might be upsetting someone. It is a very comfortable place to be. It is interesting how different everyone’s story is. One family had only 4 months with their child from the diagnosis to death. Another family, were told their child would be gone within a matter of months, and she outlived the “predictions” by 9 YEARS! Some, of the children had battles that lasted for years, some were like Alexander and were very short (Alexander was only 13 months). But no matter how long or short the battle was – and it is just that a battle, we all have a common thread in our lives. So once again – I have some new friends that I wish I never knew, but I am so glad that I have met to help me through this phase of the STUPID CANCER journey! At least you have other children (as if another child can replace the one that was lost). It has been a year since your son/daughter died. Aren’t you ready to move on yet? Often when a child or family member is going through a illness, the family will set up a web site to keep people informed. We did that for Alexander. For me, it was very helpful, I was able to decompress at the end of every day, and I didn’t have to repeat the story over and over again. However, despite the fact that I was VERY open with what was going on, some people felt they still needed to know MORE. They would ask questions – some of which had already been answered, some that they could have looked up themselves. On occasion, I would give “definitions” of the medical things to help people understand. We got all positive comments, and most of the people who read our Carepage were friends and family, or friends of friends. 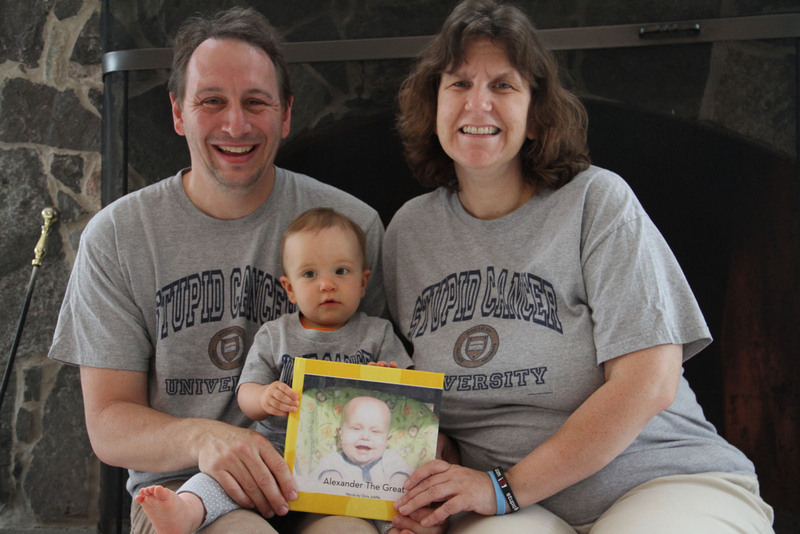 On occasion, I would have another Neuroblastoma mom follow Alexander’s stories – and I followed their child. How we found each other I may never know! Some people go beyond the Carepage. Some people have contact with the news, and are VERY public with their journey. This can be good and bad. I am amazed though following other kids journeys, kids whose stories have been picked up by the local news, at the horrible comments some people will write! Not so much on the Carepage, but in the comment section of the news article. So, these are clearly coming from people who don’t really “know” the family, and based on the comments have never lived through such a trial. Another story I was following about a little girl with a brain tumor. Also, a story that was picked up by local news. The parents put on their Carepage “we appreciate the suggestions for treatment, but we are very confident in our doctors”. They had gotten “advice” from strangers – “you should go to this hospital or that….you should try this herbal medicine”. At one point they posted they were taking her home because there was nothing more that could be done for her. Someone wrote on their face book page “I don’t understand why they don’t TRY radiation again – what harm can it do?” Yes, lady, you DON’T understand…. I read an article about a girl who had gotten a long-awaited heart transplant. A wonderful thing – I am a big supporter of Organ Donation, I hope when I die I can be one. But someone wrote a comment “God ALLOWED this miracle to happen” I wondered how the family of the donor felt about that comment. Why didn’t God “allow” their love one to live? So where I am going with all of this? Well, I just ask that if you do follow care pages, news articles, etc, and feel compelled to leave a message, PLEASE only leave a POSITIVE one – tell the family you are praying for them, thinking of them, sending up good wishes. Keep it at that. Before Julia was born, I asked people for BOTTLE feeding advice and to please keep your breastfeeding advice to yourself. Well, a few people still felt the need to share some breastfeeding “advice” even though I had made it clear, that was not the choice I was making. I was pretty put off by that. I recently posted that we are pregnant and that we found out that the baby is going to have some problems. I got a lot of “Oh, those tests are NEVER right” and “they told me my child was going to have xyz and they are fine”. Well, good for you and your kid! But, they are 99% sure my kid IS going to have a problem. Yes, tests can be wrong sure, but I wasn’t looking for advice, I was looking for SUPPORT!! You may have a mind full of advice, and opinions, but if you don’t know these people personally, keep it to yourself. And if you DO know them personally, talk to them about it in private. Not for the world to see.